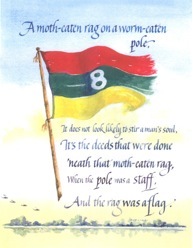 This is the true story of how the original 8 Field Ambulance flag was procured and eventually found its way back to the Active Eight. It was originally taken illegally by a young enterprising digger the night before his departure from SVN in July 1967. This digger will remain nameless but was in fact was a 2 Field cook on three months extension with 8 Field, who apparently had a liking for war souvenirs. How he managed to nick this flag presumably out of the Orderly Room at night, is a mystery that could have led him to being a guest of the Provost Marshall. However this misdemeanour was beneficial to the Active Eight in having their flag returned to its rightful owners. 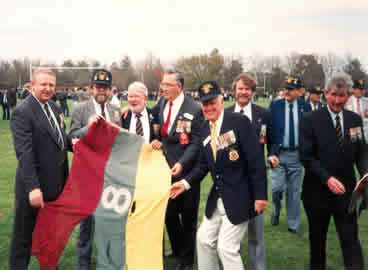 In 1992 at the opening of the Vietnam Memorial in Canberra this certain cook who was marching with 2 Field, felt it was now time to return this relic to those of 8 Field. On handing over the flag to members of Active Eight he explained he had kept our flag in the bottom of an old wardrobe in his shed for many years, hence it become moth eaten. Eventually in 2000 this original 8 Field Ambulance flag was officially presented to the Australian War Memorial.